On one hand this story is 26 hours long, the time it took us to complete our 352km route and climb 8,848 meters to equal the elevation of Mt. Everest. But to just explain the course of events that unfolded in the San Gabriel Mountains over that weekend would be leaving out the three years leading up to this ride. Video by Samuel Arechiga. Photography by Tracy Chandler. The real story of my “Everlasting” attempt began the first time I ever heard about the concept, riding the elevation of Mt. Everest. I was trading stories with a few friends on a ride, when one of them asked if we had heard of this new thing called “Everesting.” I was hooked instantly. “What an incredibly simple, and compelling challenge,” I thought to myself. I felt that if I could pass this test, I would prove something to myself. I’m not totally sure what, but I think it has something to do with the inevitable and crushing insignificance of my own existence in the true cosmic scale of our shared reality. It also had a cool name. Everesting. Wow! So, why wait three years? Well, there are plenty of excuses about moving three times, other projects, work, family, and travel, but the truth is more about fear than planning or convenience. The beautiful thing about something like this is that success and failure are painfully clear. While in other areas of our life we can shrug off failure, attributing misses to poor circumstances and bad timing, an Everesting attempt is make or break. And that moment when you first say it out loud, “I’m going to try”, there’s no turning back. When I finally made the decision, I went out and painted the word “HUNT” 5 meters long on my living room wall. That would be my daily reminder of the commitment I made to complete Deux North’s sixth Hunt, an attempt at Everesting. Over the next two months, I spent my weekends doing longer rides than I had ever completed. I would leave and return with the sun at the horizon. Coming home, I would lay on my apartment’s concrete floor as everything inside my body ached at the edge of cramping. The sore muscles and salt-crusted legs were the marks of progress as I pushed myself slowly towards a goal I held for three years. Those moments on the cold concrete were some of the most contented of my life. Those long weekend rides began to blur into one another, and before I knew it I had six people in my living room lying on the rug looking over the next day’s route on my laptop. 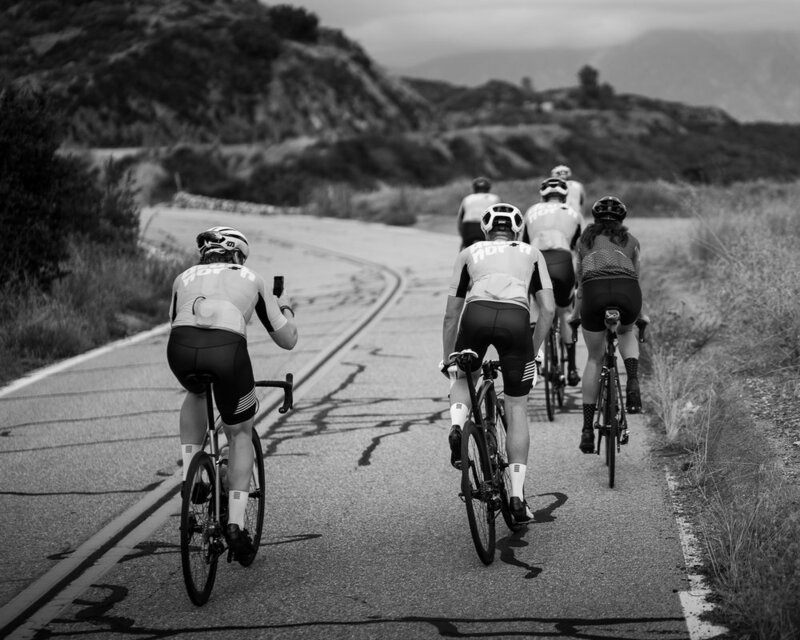 Rather than pick a single climb and repeat it until passing the 8,848m threshold, we would ride a route through the San Gabriel Mountains, east of Los Angeles in California. It would take us 320km and our best guess said it would take 16 hours to complete. With such a long riding time, we knew we would have to ride through the night, regardless of when we started. So we opted to begin in the afternoon, getting the dark hours out of the way while we were still fresh. Then we would ride the wave of elation that was sure to come from the rising sun, completing the last few kilometers with smiles on our faces. Riding through the night was the highlight. We descended winding mountain roads with powerful headlights. As the light beam tracked the curve of the road we felt more like players in a video game than cyclists. The quiet, dark, cool air gave us the space to lose hours in meaningless banter. And the light from Los Angeles 75km away bounced into the sky, creating a sort of glow across the mountains. None of us had ridden through the night before, and the novelty of this new experience made those eight hours fly by. We were set to crest the highest climb of the route just as the sun was rising, and morale climbed with us as we approached the top. But as the end drew closer the wind picked up and the air became heavy. Out of nowhere, as we tipped over the top of the first step, we entered a new climate. Those in our support van had parked at a small parking lot to sleep through the night. As the two women inside the van climbed out, the look of joy and relief on their faces met the looks of horror and disorientation on our own. The wind was blowing their van back and forth and the temperature had dropped 20 degrees. “We’re so glad to see you, we were listening to the wind all night wondering if you were ever going to make it,” they explained through tired excitement. We all tried to adjust to this new harsh world as we poured boiling hot tea down our burning throats. We had thousands of meters to climb and a few hundred more to go before our route had us descending towards warmer air. As we began to shiver, we said goodbye and turned away from the van to begin climbing again. The fog was thick, visibility was low, and our wits were waning in what was our 16th hour of riding. At first we thought it might just be raining, but as it bounced of the road and our helmets, we realized it was hail. It didn’t take any words for us to collectively agree to turn around and head down as moisture began seeping into our now day-old kits. We decided on a plan B. We would head down towards another climb 1,000 metres below our current elevation and complete a few repeats to make up for the loss. The rolling descent was slow; it took nearly an hour. I spent much of that time slapping my face and forcing conversation to keep from nodding off and careening of the road into the canyons below. This was probably the scariest part of the ride. If I had been able to muster my full reasoning power, it would have been even more frightening. While we rolled down the mountain, the sun reached higher in the sky. And though the sun was still shrouded in clouds, the rain let off. We completed our first short climb up to the top of the Mt. Wilson observatory. It was a steep, short climb that woke and warmed us up. At the top, we sat on our top tubes and pulled our phones out to test for service. Drops of condensation began collecting on our screens, and dread welled up inside our bellies. The rain began again, harder this time, and soon we were soaked at the bottom of the climb, huddled inside the van sharing nervous laughter and contingency plans. The weather report showed no respite. And as I watched the rain fall outside the steaming windshield of our van, I thought back to one of our first Deux North rides, when my good friend reminded me that it’s the things that go wrong that makes it an adventure. We had ridden through hail and rain in an area so dry it has been devastated numerous times by massive wildfires. It was now clear we couldn’t wait the rain out, and we would have wasted too much precious energy staying warm riding through it soaked to bone. We needed to head down towards warmer air. Teeth clattering and legs shaking we descended another 30km. We rode out of the mountains and down into the city below where we collected inside a gas station. As we pulled our Garmins off their mounts we noticed we were tracking way behind our expected elevation; 2,000 meters in fact. It was crushing. Now in our 23rd hour, we were supposed to be sharing congratulatory burgers, if not soundly asleep in our beds. The bathrooms inside the gas station, cheap hot chocolate, candy bars, and manufactured heat came as welcome comforts. But they betrayed us, bringing into view an escape; a way out. We couldn’t imagine backtracking into the cold wet mountains for what would be hours of climbing. But then, an idea came. “Are there any hills here in town?” We pulled out our phones and began searching Google Maps and Strava segments. We took our time, disguising procrastination for thoughtful research. And as the hot chocolate ran out, the decision and the setting for our final showdown was chosen. We wouldn’t get the dramatic backdrop of the San Gabriel Mountains for our final bow, but we might not have to bow out. The final act would play out on a small suburban hill, with 100 metres of elevation gain, and only 5 miles (8km) from the gas station. We rode over to that hill and then up and down more than 20 times. We did this mostly silently, watching our Garmins, as the feet slowly ticked up closer to our goal. As we crossed the top of the final repeat, marking the completion of 220 miles, we found more relief than excitement. The excitement came later, as it usually does. It was exciting to plug our data into Strava and discover we had climbed an extra 1,000 meters by accident. And it was exciting to recount the experience with one another. We could laugh about the pain and disappointment we experienced along the way, which now was mostly gone, replaced by a feeling of accomplishment and shared experience. Discussing it now with the other six that shared those kilometres with me, it seems each of us has distilled the experienced into a different collection of remembered moments. For me, there are three that stand out. First, the feeling of being completely empty, lying on my cold concrete floor every weekend for two months. Then, a moment in the middle of the night during the ride when I dropped back behind the group to ride alone. In the lonely stillness of the night, without my fellow riders, the excitement of the ride faded away. I was left with a monk-like appreciation. The wait was over — I was in the middle of my “Everesting” ride and it was everything I could have hoped for. Those words stuck with me. It occurs to me now that some of the most meaningful places I’ve visited have been the far reaches of my capability. I hope his outlook serves as a reminder to continue riding towards that unknown edge, where we find what was once impossible.